Under his leadership, the Chickasaw Nation has grown to become self-sustaining via economic development and business diversification. The Nation has a 3-branch system and the structure of the government supports infrastructure and businesses to build the tribal economy. Tribal monies provide funding for tribal operations, programs, and services for the Nation. As of October 2013, overall, the Nation operates 216 tribal programs and 68 federal programs. The Nation has established 6 health facilities, operates Carl Albert Indian Health Services, several diabetes care centers, 4 head starts and 12 senior centers. There are numerous scholarship programs providing 4000 students with $15 million in scholarships, grants and other support and opportunities. There are also youth academies for students. Additionally, a number of programs have been specially developed for the at-large population or those Chickasaw citizens who live outside of the Chickasaw Nation’s boundaries in Oklahoma. 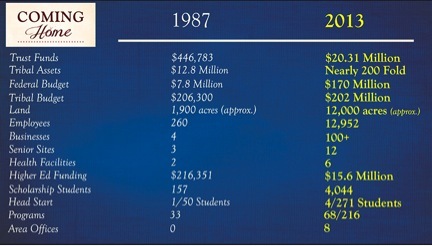 This chart depicts 20 years of economic growth for the Chickasaw Nation. Citation: State of the Chickasaw Nation 2013 https://www.chickasaw.net/Content-Images/Comparative-Statistics.aspx retrieved on 1/7/2013. The Nation has also made huge strides to preserve our Chickasaw history and culture by creating the Chickasaw Press, the Chickasaw Cultural Center, and preserving and restoring historic buildings such as the Chickasaw Capitol and the Chickasaw White House.